This book is the first biography of the brilliant inventor and practical experimenter, British-born David Edward Hughes. A contemporary of Edison and Bell, Hughes made major contributions in telegraphy, telephony, metal detection, and audiology. His printing telegraph, adopted across much of Europe, made him a fortune, and he freely gave away all of his later inventions. Hughes sent and received wireless signals in 1879, some sixteen years before Marconi, but faced with the skepticism of his peers, he discontinued his research, and his accomplishments were only recognized years later. The fruit of over ten years of research in libraries, archives, and museums, as well as access to all of Hughes's private papers and visits to places where Hughes lived and worked in the UK, US, and Europe, this is the definitive account of a great Victorian scientist whose inventions laid the foundations of the Communications Age. 100 illustrations including prints, photographs, documents, and technical illustrations. Extensive endnotes and index. David Ellis Evans live in the house where he was born in Druid, near Corwen North Wales, a stone's throw from the spot where Professor Hughes is said to have been born. He is recently retired having worked locally throughout his career, mostly in purchasing and materials management in an engineering environment. He has a strong interest in local and family history and is a first language Welsh speaker, which has been invaluable when researching some Hughes material. As David Ellis Evans and Ivor Hughes note, modern people live in a device-driven world. Most read, talk, research, and relax on computers and cell phones, oftentimes without ever wondering how this high tech world came to be so. Thanks to Evans and Hughes, Before We Went Wireless provides a thorough look into the ancestry of laptops, smartphones, and their ilk. "These technologies," they write, "which we take for granted and on which we are so dependent, can be traced back to the pioneering work of Victorian scientists." One particular Victorian scientist, David Edward Hughes, improved upon Samuel Morse's famous telegraph instrument, and worked as an early inventor of wireless and metal detection technologies. Before We Went Wireless serves as an extended biography of Hughes, "a man who ushered in the Communications Age." Hughes' inventions helped lead to the creation of present technologies, and as a result his biography makes for a compelling read, one that illuminates the foundation of the current state of communication. Before We Went Wireless chronicles Hughes' journey from beginning to end, focusing on both his life's work and his life itself. Hughes, thought of as a "child prodigy," improved upon the telegraph, effectively doubling the rate of words per minute spread across the wires. Around him worked the inventors of American legend -- Thomas Edison, Samuel Morse, Alexander Graham Bell -- as well as gifted physicists and scholars like the theoretical physicist James Clerk Maxwell. Despite his contributions to society, Hughes' life and legacy are often overlooked in American history in favor of inventors like Morse, Edison, and Bell, and the authors note that Hughes "hitherto ithis biographyi has been something of an enigma." The book is as comprehensive as it is accessible. Evans and Hughes welcome readers into this biography with clear language and diagrams that aid in the theoretical underpinnings of Hughes' inventions. While knowledge of Hughes and his work is absent from many Americans' abbreviated understanding of the Communications Age, the authors hope their volume will redress that omission. Fellow historians, the authors met through an ancestor of the great inventor, and spent a decade compiling the thorough information contained in the text. Readers of this biography will learn both of Hughes and of the ancestry of their portable devices -- knowledge crucial to understanding how, today, everyone stays in touch. 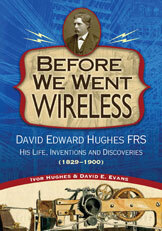 "Before We Went Wireless is the stylish new biography of inventor David Edward Hughes, and it chuffs along like a great Victorian locomotive.... Hughes not only invented the 19th century's most commercially successful telegraph, in a stunning revelation authors Hughes and Evans detail beyond a doubt his discovery of wireless in 1880 nearly two decades before Marconi's work arrives on the scene! How this happens and just why Hughes is moved to suppress his own invention makes for one of the great reads of technological history." -- Morgan Wesson, Writer, Journalist and Filmmaker whose credits include Alexander Graham Bell, and Empire of the Air with Ken Burns. "We are indebted to the authors for, finally, an authoritative biography of this significant British-American musician-turned-inventor. Family papers (including a personal notebook) add valuable insights into his thinking processes and the role that music played in his work, as do separate detailed descriptions of his innovative printing telegraph, microphone and relay, among other devices.... This work is a valuable addition to the literature on nineteenth-century invention." "It is always with great pleasure that we hear of a new piece of scholarship on one of the perhaps lesser known names in our canon. Hughes sought to improve all of our lives and I sincerely hope that you enjoy reading about this great man." "This deeply researched biography of David Hughes provides a much needed account of this important but neglected nineteenth-century electrical experimenter and inventor. The authors provide a lively narrative that follows his transatlantic adventures while offering fascinating and important insights into his life and work."